Voci (Voices) is a full-evening, multimedia performance work exploring the sonic, cultural, physical, and artistic worlds of the voice, celebrating the broad range of colours in the singing voice and speaking voice, and examining scientific and cultural phenomena around the voice and the many metaphors for voice. 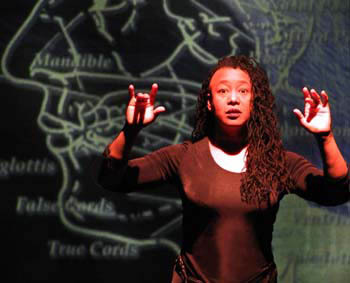 In addition to Pamela Z's dramatic performance work with voice and live electronic processing, Voci features vivid, tall video projections designed by filmmakers Jeanne Finley and John Muse and a stunning lighting design by Elaine Buckholtz. 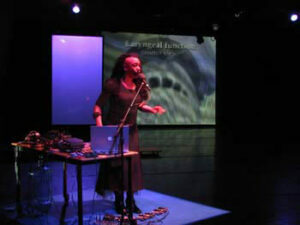 Written, composed, and performed by Pamela Z, Voci consists of layered, dynamically varied segments incorporating live electroacoustic vocal work with real-time digital processing, vocal samples (triggered with light and gesture controllers), and video (projected and on monitors). The stage is alive with unexpected visual and auditory transformations, and from time to time, Z performs "virtual duets" with some surprise guests who appear in the form of video samples. These segments approach voice as anatomy, as character, as identifier, and communicator. Weaving together stories about voice with arias, non-verbal utterances, cries and whispers, choruses of "real" and synthetic voices, and fragments of scientific information, Pamela Z builds a kind of polyphonic mono-opera.